The most important female figure in that period of the history of Ancient Egypt was Nefertiti. She had a higher status than former royal wives did, even in religion. Not only she had her own role in the cult to the Aten, iconography shows how it was considered that Nefertiti had a reviving power in herself. The sarcophagus of Akhenaten is a clear proof of that. The image of Nefertiti appears at the four corners of the sarcophagus embracing the corpse from every point. 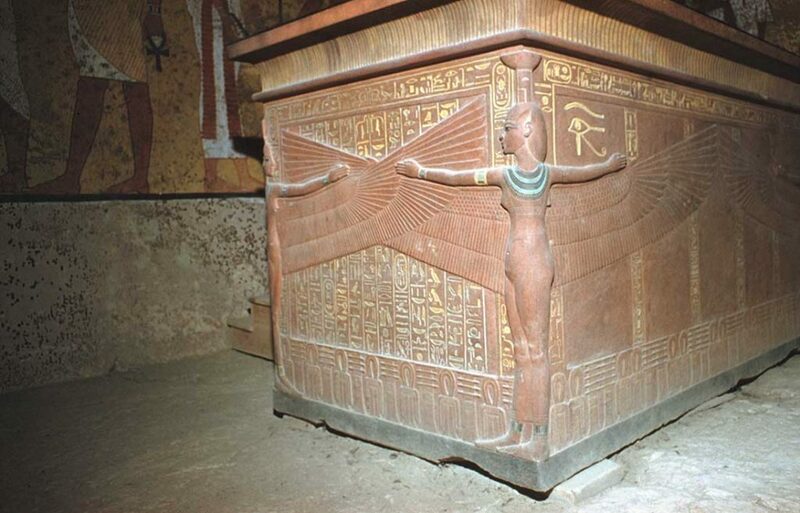 Until that moment, Isis and Nephthys were depicted at both ends of sarcophagi and coffins. 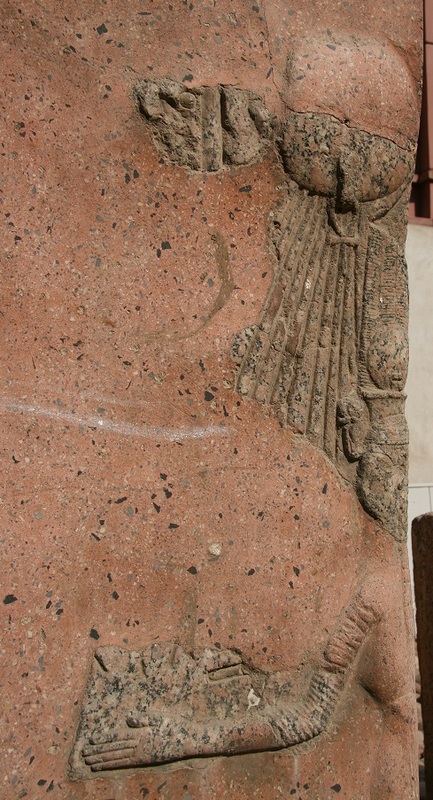 Detail of Nefertiti embracing the sarcophagus of Akehanten. Cairo Museum. Photo: Mª Rosa Valdesogo. However, once the Osirian theology disappeared and with it these two regenerating goddesses, it seems that Nefertiti took their role. For that reason her image appears in the king’s sarcophagus, because she could grant the resurrection of Akhenaten, as previously did Isis and Nephthys. So, the concept remained, but it was reinterpreted under the Atenism. 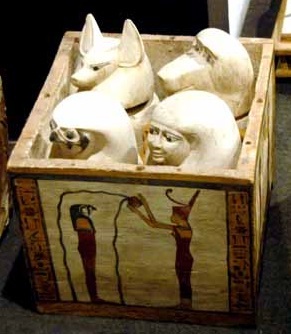 This idea remains reinforced when we have a look at later sarcophagi of Tutankhamoun and Ay. Detail of sarcophagus of Tutankhamoun. Nephthys ant one corner embracing the corpse. Photo: www.osirisnet.net. Once the traditional religion of Ancient Egypt was restored and ancient deities were again worshipped, the female responsible of the dead’s resurrection recovered their role. 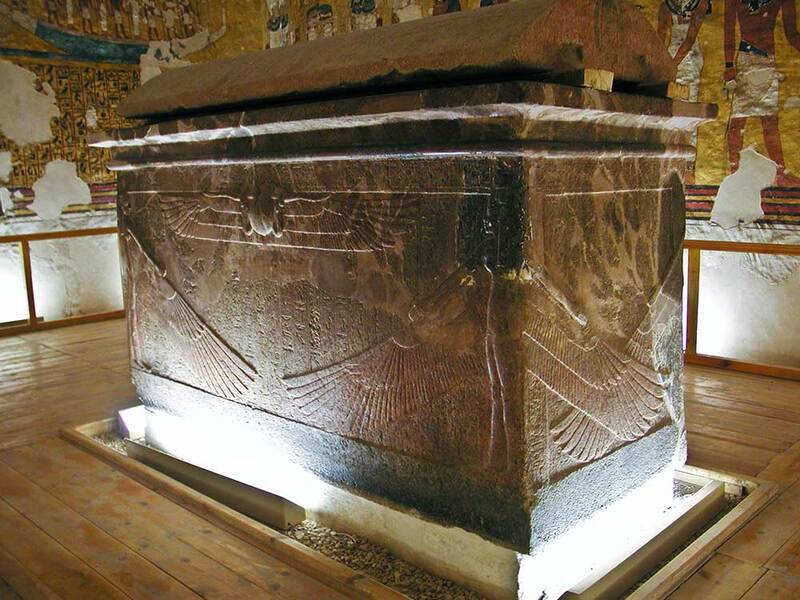 Sarcophagus of Ay. Photo: www.osirisnet.net. That is why in the sarcophagi of Tutankhamun and Ay the four corners were occupied by Isis, Nephthys, Serket and Neith. The group of four goddesses who granted the dead’s resurrection were the subtitute of Nefertiti at the four corners embracing the mummy. If Nefertiti took the role of other (ancient) female Goddesses responsible for resurrection and regeneration, then she must have been idolized as a higher/supreme deity – alongside Akhenaten – by the followers of this new cult of Atenism. I’d say this is not monotheism as much as it is a (politically-motivated) variation on an older Egyptian theme. So, how do you, as an Egyptologist, view the new cult of Akhenaten and his wife? Wow!!! this is a very deep and extense question!!! Effectively, the role of Nefertiti during the Amarna Period was very important and she even took the place of ancient deities; it was supposed that Nefertiti had their functions and their power. Yes, she-alongside with Akhenaten- were directly involved in the new cult. But I also agree that it was not just a new religion, but a new political system in which the royal couple had a more visible role than in past times. That is, the female element was essential in that new system. With Hatshepsut, a woman was ruler of Egypt, but as a concept, she had to became a man (in depictions…), she had to be king, not queen. In the Amarna Period, the woman (Nefertiti) became a key piece of the religious and political system, without ceasing to be a woman and a royal wife. Why? maybe because the Atonism was based on the solar theology from Heliopolis and it needed the male and female principles hanging of the Sun God. That is, Akhenaten and Nefertiti took the place of Shu and Tefnut. The point is, existed a direct cult to the royal couple? in fact no, they just were a conductor,a filter, to reach the Aton. They were like mediators. The subjet needs much more time and words. A reply to a post is not enough, but I hope my small answer could help you.